Easy post, I thought. Just write about the deadly nightshade. I happened to be thinking about the perennial, semi-woody, weedy vine that lurks along my property boundaries, and climbs up through the links of the fence. It can grow to six feet and the leaves have distinctive “ears” at the base. Its purple flowers bloom in summer, and the berries ripen to an alluring red. Warned as a child not to eat the berries or leaves, I've been pulling it my entire gardening life. 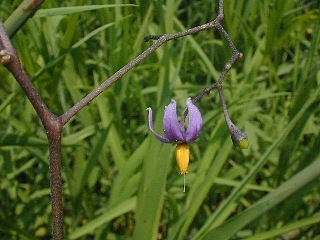 A little research informed me that this plant is also called bittersweet nightshade, or Solanum dulcamara. Bittersweet nightshade belongs to the Solanaceae, or Nightshade, family. Famous relatives among the Solanaceae include eggplants (Solanum melongena L.), potatoes (Solanum tuberosum L.), and tomatoes (Lycopersicon esculentum). In this case, the species name, dulcamara, supposedly refers to the berries’ taste, which the toxin causes to be bitter and then sweet. 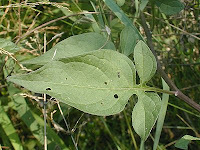 This non-native nightshade is indeed toxic, in foliage and fruit, and is considered an invasive weed: it grows pretty much anywhere—sun, shade, in backyards, pastures, along railroad embankments and in urban vacant lots. John Hilty at Illinois Wildflowers recommends wearing gloves when pulling it and warning children not to eat the attractive berries. As in pokeweed, birds like the berries, so it spreads easily. 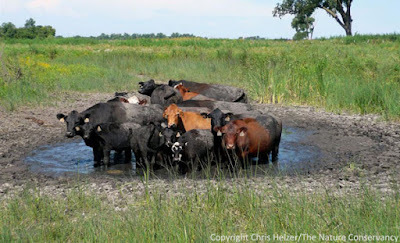 Most wild mammals have the sense to leave it alone, but the Ohio Perennial and Biennial Weed Guide says there have been documented cases of domestic grazers being poisoned. 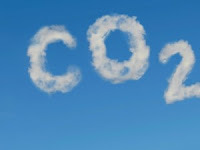 Like the bindweed, it is difficult to get rid of: it has somewhat brittle roots, and when you pull it, any little bits of rhizome left in the soil will sprout new plants. All of these species look extremely similar. 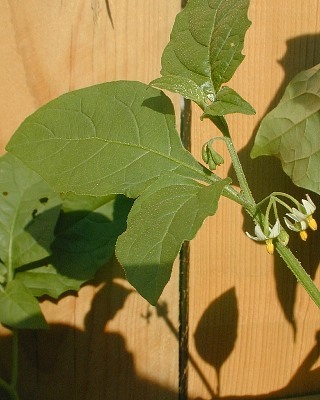 In general, black nightshade is erect, growing about one to three feet tall, with alternate, ovate leaves whose margins may or may not be smooth or be bluntly dentate, and has white flowers that develop into black berries. Introduced or not, and regardless of which closely allied species is most common where you live, in the U.S. it, like S. dulcamara, grows just about anywhere. Even though it’s an annual, it spreads easily by reseeding itself. The green berries are toxic, the ripe berries, not. 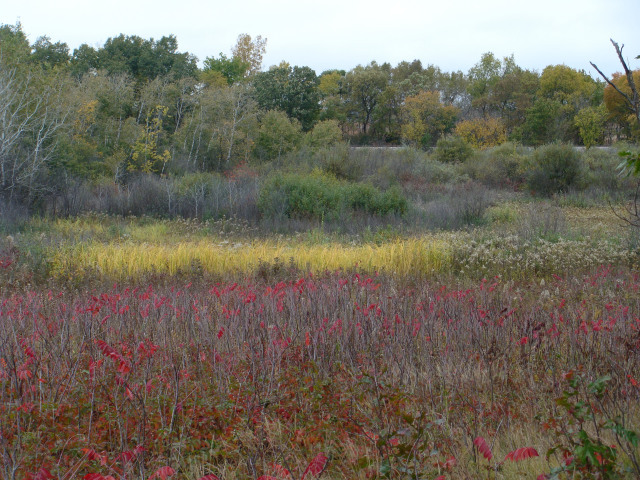 Birds eat the berries, but mammalian herbivores avoid the toxic foliage. In the past, there has been controversy about whether black nightshade berries were poisonous or not: in Europe they seemed to be, and people died of nightshade poisoning, while people in other parts of the world have regularly eaten the berries. Foraging expert Samuel Thayer, author of Nature’s Garden, has an analysis at his site Forager’s Harvest. After a review of literature, Thayer concludes that what people thought was poisoning by S. nigrum was actually poisoning by yet another "deadly nightshade" native to Europe, Atropa belladonna, famous in history as a cosmetic, medicine, and favored, murderous poison. It is one of the deadliest plants of Europe and has its own long, fascinating story. 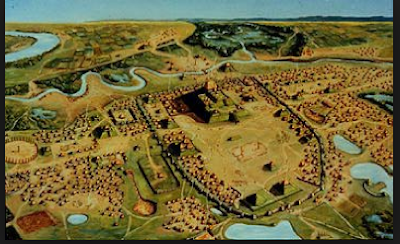 See this article at Wikipedia, for starters. 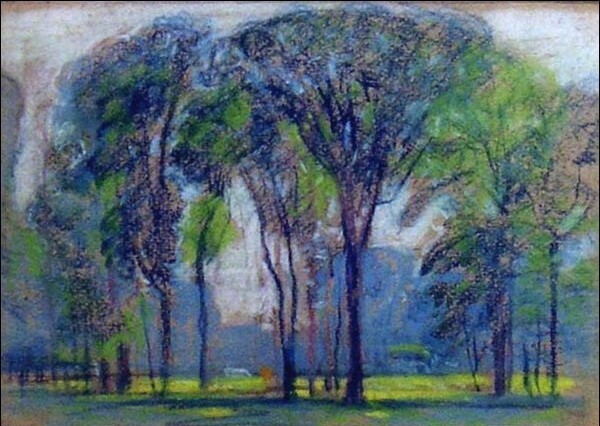 Thayer cites instances of people in the U.S. making jam out the ripe, black berries of S. ptychanthum, and he, himself, eats them raw and cooked as jam. However, he also says, “read the above description of black nightshade carefully, as there are a number of other nightshades with toxic fruit.” And what might these be, I wondered? In the U.S.--besides A. belladonna (cultivated here)--bull nettle or horse nettle (Solanum carolinense), a prickly, toxic plant with white or lavender flowers and toxic yellow fruit is widespread in the East; and silver-leaf nightshade or white horse nettle (Solanum eleagnifolium), a different prickly, toxic plant with lavender or white flowers and toxic yellow and orange fruit inhabits the Southwest. And then there is the Jeruselum cherry (Solanum pseudocapsicum), native to Peru and Ecuador, grown widely as a houseplant. 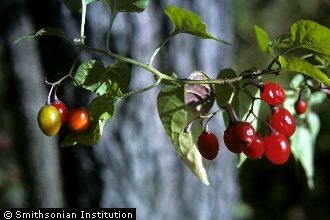 Its toxic red fruit resemble and taste like cherry tomatoes. One wonders whether these were the “tomatoes” that caused Europeans to think tomatoes were poisonous? Nightshade seems a fitting family name for these plants, since the clan includes some dangerous characters, indeed. Considering how poisonous qualities run in their genes, one wonders how we humans figured out which are good to eat. The experimentation involved, and its potential effects, makes one shudder. I intend to keep weeding out both bittersweet nightshade and black nightshade, wearing gloves. But I sure do love tomatoes. Note: This weed story took a toxic turn by accident. 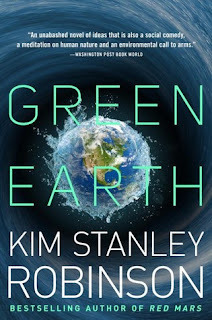 Author Amy Stewart has written Wicked Plants, a whole book about toxic plants, on purpose, which I hear is worth a read, though I haven’t gotten to it yet. Pictures are from John Hilty's Illinois Wildflowers and the USDA Plants Database. Solanum dulcamara--yes, it's spread all over the place around here. And I spend way too much of my time trying to get rid of it. But I thought the "bittersweet" reference in the common name referred to the semi-woody, climbing stems. Someone, I assumed, must have thought the plant bore a resemblance to bittersweet (Celastrus scandens, or it's invasive Asian relative, Celastrus orbiculatus). Of course, it's also entirely possible that the Solanum species was called bittersweet for the reason you mention, and the two Celastrus species were named bittersweet because of their resemblance to the nightshade. I wonder if anyone knows? That is a very good question. Wikipedia mentions early American colonists confusing the plants--but they seem awfully different to me. Let me know if you find anything out. Hi Jean, lucky you! Yes, that confusion is easy to do--I've done it myself, and might again, without my wildflower book. As I mentioned, datura was one of Renoir's favorite flowers, and you are right, it is also knowsn as Jimson weed. I think he must have liked its beautiful trumpet shape, that hangs down gracefully. The ones I have seen have been on cultivated, three-like plants, and covered with blooms are spectacularly beautiful. I have photographed white,yellow,pale pink blooms. Thanks for the very intersting essay. I saw a lot of wild datura when I lived in New Mexico, in the high desert country. Beautiful, but not what people want to have in their gardens. Someone here in IL gave us some thornapple seeds a few years ago, which turned out to be datura. They are beautiful but now we consider them weeds. The seeds are dangerously thorny, and we don't want anyone to get hurt. For the same reason I don't want to have gooseberries or roses. Thanks for this interesting article. 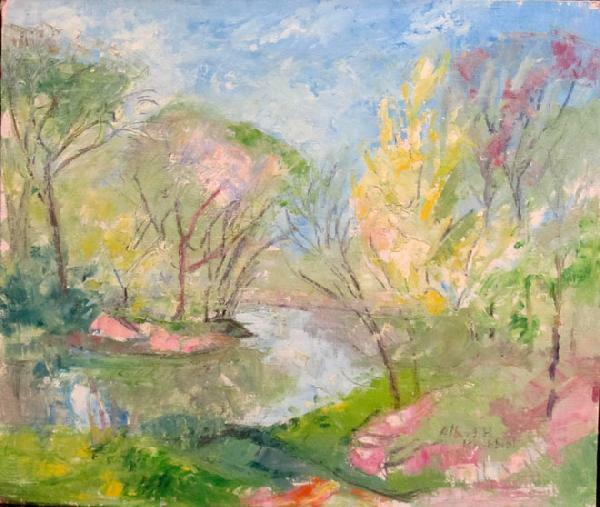 I was just this weekend at a workshop with Sam Thayer. He shared his research that nightshades (the solanums) are eaten as a prized cooked green all around the world when they're young and tender. He regularly eats the young greens as well and ate and shared some with participants in the walk yesterday. He has shared the cooked greens all around the country at numerous workshops to prove their tastiness and safety. The day before yesterday, my 9 year old daughter "sampled"
a berry from a weed in her school garden. She mentioned casually that she had eaten deadly nightshade. When she mentioned that she had eaten deadly nightshade, I mistakenly did not take that too seriously. (She is a bit botanically precocious but prone to exaggeration. Also, on the AS spectrum) I could not believe the school garden would plant nightshade. She told me that the fruit did not taste good and she had spat it out after a bit of chewing. This did not match with deadly nightshade, which I understand has a somewhat pleasant sweet after-flavor. However, by last night, after spending the afternoon nursing her endless vomiting, I found myself hopping the fence of the school as she directed me to the plant. A weedy slightly woody solanacious plant with small white petals surrounding bright yellow stamens was growing there. Many of the bunches of fruit featured some "dark navy blue" berries that she had described - interspersed with some green ones. I took a good look at it, plucked a branch, and took it home to id. I promptly called poison control after I tentatively identified "black nightshade." 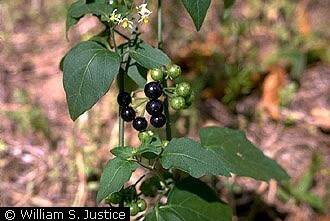 Both of the hotline volunteers I spoke with over the night assured me that it was indeed black nightshade. They told me to continue to monitor her through the night and take her to er if she started running a fever or acting strangely. (Besides the incessant vomiting and some belligerence, she was mostly the same girl, running around and playing between bouts of retching. (Ok, perhaps quieter than usual but not what I would think a poison victim. Since she had ingested what they said was a small amount, we mainly had to try to keep her hydrated. I got some pedialyte and gatorade and she finally kept a few ounces down before she fell deeply asleep. I monitored her through the night, looking for fever, strange pulse, discomfort, irregular breathing. Anything unusual. This morning she woke, paler than usual, but able to take some gator ade. Says her stomach feels fine. By the way, she weighs about 95 pounds (larger for a 9 year old) and is in good health usually. Will take her in for a check up today or tomorrow. 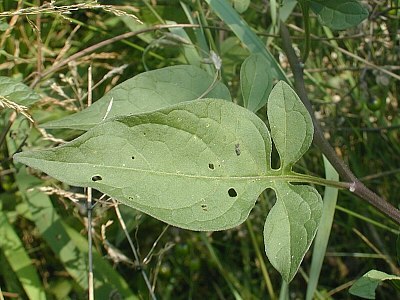 This weed (or nightshade that resemble it) is common everywhere. From what I have read on the internet and Jepson Manual 1993. It makes sense to be cautious around these plants and to say (yet again, and again and again) to our children that they need to ask an adult's permission before they eat anything.